I've shared with you recently about how the Lord has been speaking to me that it's time to expand. But many of you have been asking, "What's happening in Canada?" and "Where are my gifts to Andrew Wommack Ministries (AWM) and Charis in Canada going?" My vision is to reach as far and as deep with the Gospel as possible all around the world. In Canada, we've been accomplishing this through television, meetings, and Charis Bible College. Right now, our Canadian ministry is preparing for the biggest "growth spurt" since its doors opened in Toronto seven years ago. My team and I still talk about the very first Gospel Truth Rally back in June 2012. We didn't know how many people to expect and weren't sure if we'd be able to fill 1,000 seats. To our surprise, the room was so full that people were sitting on the floor and standing in the hallway! It was clear to us that these meetings in Canada had even bigger potential than we had imagined. 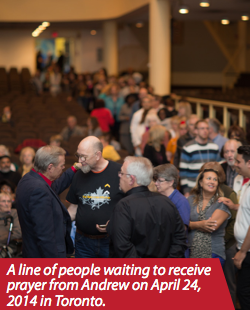 To date, we've had three Gospel Truth Rallies in Toronto. Attendance has been increasing each year, and so has the number of people who have received salvation, the baptism of the Holy Spirit, and healing. I will be coming back to Toronto on June 20. It will be my fourth time ministering in Canada. There has been such an overwhelming need for prayer at our past meetings in Toronto, so this year, I'll have prayer ministers available before and after the service. I hope to see you there! My Gospel Truth television program started broadcasting in Canada on the Christian Channel (now Daystar Canada) in 2008. Since then, we've added CTS (now Yes TV), Miracle Channel, and Joy TV. These stations have the potential of reaching over ten million homes from coast to coast, but there are still millions of Canadians who are not able to hear this message. We are prayerfully considering new ways we can make my television broadcasts more accessible, including adding new time slots on evenings or weekends, adding new stations, and even translating the program into French. New Charis Bible College start-up locations can be expensive, especially in a big city like Toronto. But God always has a plan. The pastors of Unveiling Life--a church located in Woodbridge about thirty minutes northwest of Toronto--generously offered their facility for Charis Toronto to hold classes on weekdays. In September 2013, we launched our first Charis Bible College Canada location in the Greater Toronto Area with seventeen first-year students. In September 2014, we added a second-year program, and enrollment increased to forty-six students. I spent some time at Charis Toronto the last time I came to Canada. We have such an awesome group of students who are on fire for Jesus. In a few short months, we will have our first Charis Toronto graduating class. Charis Toronto is positioned to make an impact not only in Canada but also the world. It's exciting what God is doing! Unveiling Life has been such a blessing to us over the last two years. This relationship has allowed us to keep the school's operating costs low. But with our increasing student population and the addition of a third-year program, we are outgrowing this space. We are now in need of a larger location that will bring both our Charis Toronto and AWMC offices together under one roof. Our hope is that it will be affordable, easily accessible to commuters and public transportation, and large enough to accommodate many more students, host Charis events, and expand our administration and production departments. I trust that God will lead us to the right location, and I ask that you stand with us in prayer. I'm excited to see what happens as we expand the ministry and open more Charis locations across Canada. Although we've faced challenges, I'm so encouraged by the faithful support of our Canadian partners. The impact of the transformative message of God's love and grace is reflected in the way you give so generously to the work of this ministry. Thank you so much. We appreciate you.